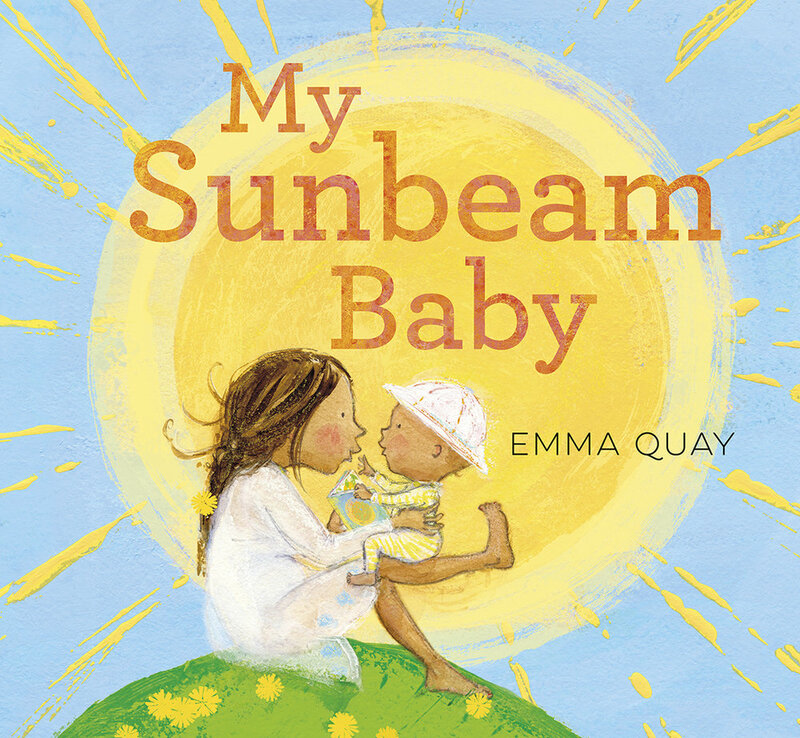 One morning, after a sleepless night on a boat and as the sun was rising, an idea popped into my head — it was a snippet of text for My Sunbeam Baby, but I didn’t know that yet. Luckily, I had a sketchbook beside the mattress and was able to open my eyes enough to scribble my ideas down. You can see I was beginning to imagine the sunbeam babies dancing around the sun; the drawing is very rough, with just enough visual information to remind me, later, what I was seeing in my mind’s eye. In the opening illustration of the mother and child on the hill I wanted to use a painterly approach to render a childlike impression of the sun, so I used thick acrylic paints laid on with a palette knife (almost like spreading butter), sponging, sgraffito and stamping with the edges of strips of cardboard for the sun's rays. I had a lot of fun making patterns and shapes in all sorts of ways. Photoshop helped me bring them all together, as a digital collage. Here, I’m drawing and painting the ‘If babies were party lights’ illustration in pencil, acrylics, pastels and watercolours, then working on the image on my MacBook Pro as a 300dpi CMYK Photoshop document with many layers, which (when finished) was flattened and saved in TIF format to send to the publisher. It’s interesting to compare the artwork I was seeing while I created the illustrations alongside the printed pages in the book. The way light shines through an image file on a computer screen can never be reproduced on paper, but the colours on the finished double-page spread look just as I hoped, and I’m really happy with it. You can see the the digital pre-press studio has matched the colours of my artwork beautifully in the proof on the left. Hinged at the top is an acetate overlay which indicates where the type will be debossed. On the right is the finished article — the printed and bound hard cover book. The linen texture and the debossed title give the cover a lovely tactile quality. 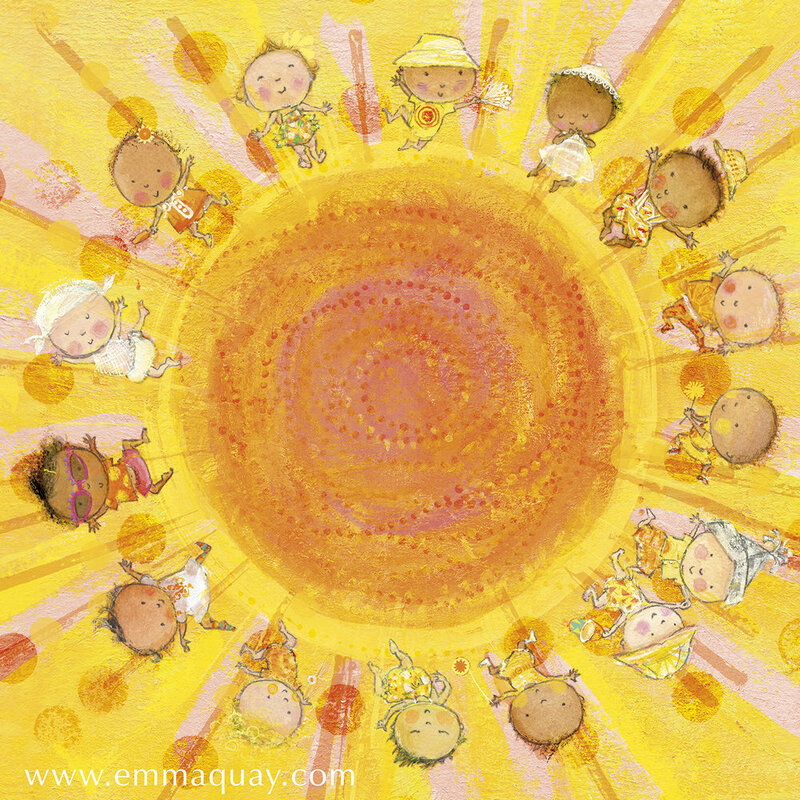 The endpapers from ‘My Sunbeam Baby’ with their daytime and night-time open and closing dandelions, marking the passage of time and mirroring the closing eyes of the child reader as their bedtime story ends and it is time to sleep. To add colour and texture to the letters of the title, I supplied the designer Hazel Lam with an image taken from the centre of the orange and pink sun on page five of the book. I like the way the mottled colour breaks up and in places seems to dissolve the forms of the type — almost as if one is looking into the sun!